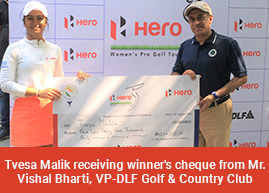 Hyderabad, August 21: In-form Amandeep Drall, who is on a roll with three wins in the last four events, will battle it out with Tvesa Malik in the 12th leg of the Hero Women’s Pro Golf Tour. In the event beginning at the Hyderabad Golf Club on Wednesday, Amandeep will be hoping to win yet again and narrow the gap with the likes of leader Tvesa Malik and the absent Neha Tripathi on the Hero Order of Merit. Amandeep, who won the eighth, 10th and 11th legs of the Tour, is currently third on the Order of Merit behind Tvesa and Neha. Amandeep is however the only player to have three wins this season, while Gursimar Badwal has two. Gursimar is not in the field this week. Meanwhile, Tvesa will be looking to thwart Amandeep’s winning run and extend her lead at the top of the Merit list. Amandeep and Tvesa will be the big favourites in a field that does not have Neha Tripathi, Gursimar Badwal or Gaurika Bishnoi. Vani Kapoor and Sharmila Nicollet are also absent, playing in overseas events. This will help new stars like Khushi Khanijau and others to make a bid for their maiden title. In the first round on Wednesday, Mehar Atwal and local amateur Sneha Singh, playing in her maiden event on the Hero WPGT, will be the first to tee off in a 2-ball, followed by Millie Saroha, Tvesa Malik and Ayesha Kapur in the first 3-ball. Afshan Fatima, Khushi Khanijau and Amandeep Drall will constitute the third group, to be followed by Sonam Chugh, Siddhi Kapoor and Suchitra Ramesh in the last group.